The babbling egg-spawn of your teaming shores. I lift a carrot beside the golden door! The Creature Repository (or TCR) is ElasticMuffin's latest attempt at a Creatures site, begun in late 2004 and launched for the CCSF 2006. The site's goal is to provide downloads for as wide a variety of creatures as possible to enhance the gene pools of breeders, while making it easy to search for particular types of creature. 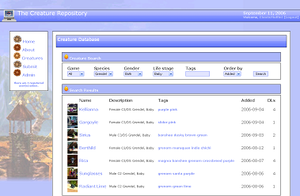 Registered users can submit their creatures to the database, and everyone can download the creatures along with a photo and the creature's information. The site uses tags to describe the characteristics (such as colors and breed) of each creature and to make it easier to find creatures with a certain trait. You can also browse random creatures from the database, or creatures submitted by certain users. The site has a few handy tools for registered users, including one that can grab all of the pictures from C3/DS exported creatures in JPG, PNG, or GIF format. Work on the site began in July 2006, and it was released just in time for the CCSF 2006 that August. All submissions enter a queue and are approved by a moderator in order to be admitted to the database. The submitter will receive an e-mail when his/her Creature is processed. The site is no longer actively updated, but submissions are still accepted. As of February 2, 2014, the site had over 2300 Creatures and over 19000 downloads. This page was last modified on 18 August 2014, at 02:04.